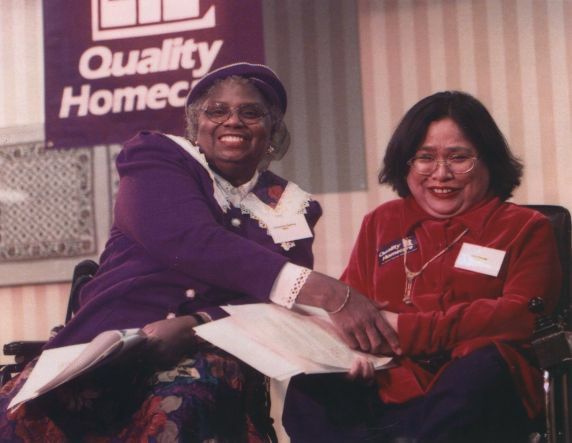 Local 434B homecare workers election and press conference, 1999. Armentress Ramsay (left) and Lillibeth Navarro (right), speakers on behalf of the Personal Assistance Services Council, shake hands during a news conference to announce the results of the SEIU election in Los Angeles. The election outcome resulted in over 75,000 home healthcare workers joining the Local 434B. It was expected to boost pay above minimum wage and create a more professional workforce that cared for about 80,000 disabled and elderly patients who received in-home assistance.